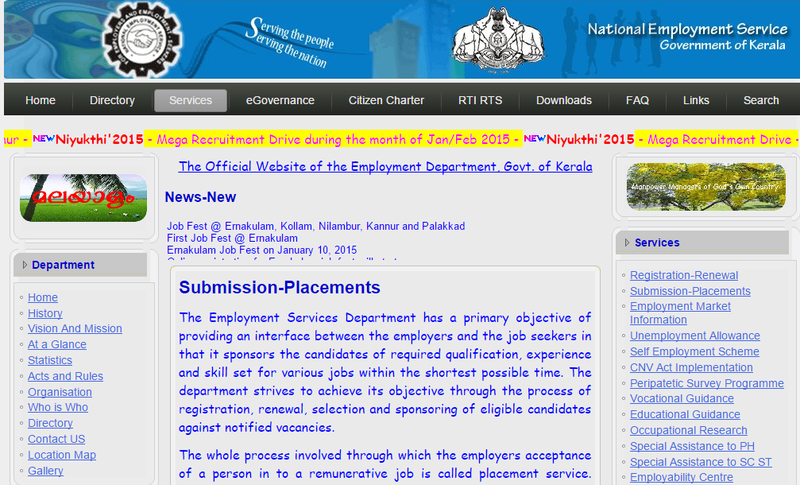 http://employmentkerala.gov.in is the official website of Employment Exchange, National Employment Service, Government of Kerala. Services: Registration Renewal, Submission Placement, Unemployment Allowance, Vocational and Educational Guidance, Vacancy Notification, Self Employment Scheme, Employment Market Information etc. In order to Register one`s Name in the Employment Exchange of Kerala one have to report in person in the Employment Exchange with all documents in original and copy. Minimum age limit for Registering is 14 years and there is no maximum age limit. Person with Professional & Executive qualifications can register their names in the Professional & Executive Employment Office, Trivandrum or the Regional Professional & Executive Employment Exchanges at Ernakulam or Calicut and in their Local Employment Exchange also. Literacy is considered as the minimum qualification for registering in the Employment Exchange. Certificate proving caste if belongs to reservation communities. Marital status Certificate to claim benefits given to Widows / Divorced / Unmarried and over 35 years of age. Registration is Free and an Identity card will be given to the Applicant for Free. Applicants can add their Qualifications later as and when they acquired. Selection is based on Seniority based on First Come First Serve Basis. Registration is valid for 3 years. Once 3 years are over Registrant have to Renew their Registration. There will be a grace period of 2 months, renewal have to be done within the grace period.